The new flagship N97 smartphone wasn’t Nokia’s only product announcement today, with the company unveiling a standalone Internet radio and music streaming device. 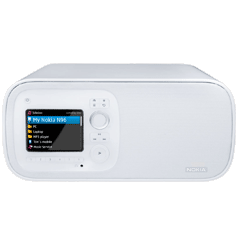 Dubbed the Nokia Home Music, the device connects to the net via WiFi or Ethernet to stream music from Internet radio stations and access podcasts, and can also stream music from a PC, mobile phone or alternatively any UPnP device (see our DLNA guide) on your home network. Alternatively, there’s a USB port provided so that, presumably, you can also plug in an external hard drive or MP3 player. There’s also an auxiliary line-in and good old fashioned FM tuner, providing further music playback options. To get sound out, there’s a built-in 10 watt speaker, SPDIF Optical output, RCA line-out, and a 3.5 inch head phone jack. No word yet on pricing or availability but it’s interesting nonetheless to see Nokia continue to expand its consumer electronics remit beyond cell phones. Update: Interestingly, the Nokia Home Music device also supports Windows Media DRM so that it’s compatible with Nokia’s Comes With Music all-you-can-eat music subscription service.